If you're new to puppy training you'll probably have lots of unanswered questions churning around in your head. Relax, you'll find everything you need to help your puppy become a well-behave little boy or girl in no time at all! Don't mess with me Buster! 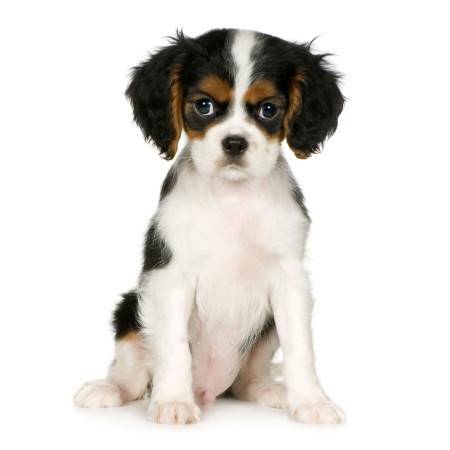 Puppies need a lot of training if they're to grow into happy, well-behaved adult Cocker Spaniels, but where do you begin? Well, as a starting point, I recommend you read these 10 essential rules of puppy training first. This will help to get you in the right frame of mind and make training your puppy much easier! Come back to this page when you've read through them. Go ahead, I'll wait for you. Your first priority will be to make sure that your puppy is fully house-trained (if he's not already). I admit toilet training may take a little patience and understanding, and there will probably be a few little 'accidents' along the way, but if you follow my advice your puppy will soon get the hang of it and he'll be dry in no time at all! If he's not already house-trained you can easily learn how to potty train your puppy here. Now, this next bit is about socializing your puppy (no it doesn't mean he gets to party, although it can be fun!) but it's vital that your pup gets plenty of it. Read on to learn more about it. Socialization is an important part of any puppy's training. It simply can't wait and should be started as soon as you get him home. If you're not sure what it is, socialization is how your puppy is gently introduced to everyday sights and objects, sounds, experiences and situations. Socializing your puppy will help to remove the fear or shock factor from his little 'human world' and will help him to grow up relaxed and confident, but beware, any frightening or shocking experience can have a really negative impact on your puppy's development, so take it easy. It's a good idea to teach your little boy to feel comfortable about being on his own for a little while own each day, (even if you're home) otherwise he may begin to suffer from a condition known as 'separation anxiety'. This is exactly as it sounds; it's where your puppy becomes very anxious whenever he thinks you're about to leave the house without him. Apart from the emotional suffering, for both owner and pet, separation anxiety can also lead to many unwanted behavioral problems such as peeing in the house (or worse), barking, howling, 'digging', scratching, chewing and other destructive behaviors. An anxious dog can do a lot of damage in the time it takes you to get to the shops and back! If your puppy begins to show any signs of nervousness or anxiety when you leave the house, you may still have time to teach him to be comfortable spending time alone, or at the very least you'll be able to teach him how to handle it better. If you're new to dog ownership, you'll soon discover that puppies bite, and boy are their teeth sharp! Play biting is a natural part of your new puppy's development, but it's important that he learns to be gentle and he understands that biting humans isn't allowed...and the sooner he learns this, the better. Just make sure you teach your puppy to stop biting before he has the strength to do some real damage! The same applies to your puppy's chewing; deal with it as soon as he begins the dreaded 'chewing phase', otherwise his chewing could become habitual and continue through to adulthood. And trust me, adult teeth can do a lot more damage than little puppy teeth. They can cause an awful lot of destruction and much despair for the owner - problems that would never have happened had the pup's biting and chewing been addressed much earlier. There is another area of puppy training that's very important if your pet is to fit into our human world and that's obedience training. However, before I explain how to teach your puppy basic obedience commands, I've set out some general puppy training tips to help your training sessions run more smoothly. 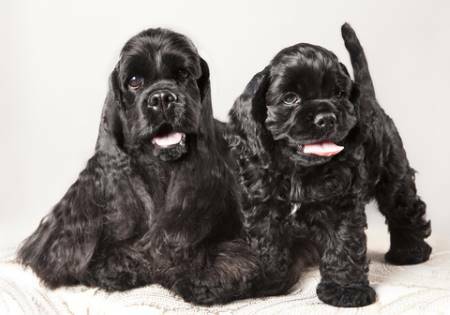 I highly recommend you read these tips before attempting to train your Cocker Spaniel, and always use positive training methods with your baby. 'Watch!' - teach your puppy to look at you and pay attention - once you've got his attention, it will make training him much easier. 'Sit!' 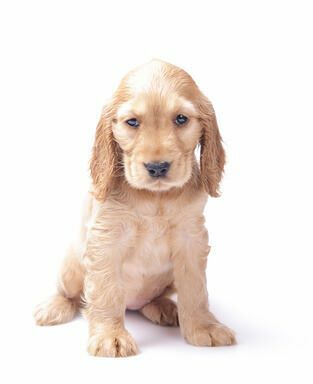 - puppy training is much easier to do than you may at first think and you'll be surprised at how quickly your Cocker puppy learns this particular command. 'Down!' - this is a great command to teach your puppy. It's slightly more difficult to do than the rest, but once he's mastered it, you'll use it often. 'Stand!' - you'll could use this command when you want your dog to stand quietly for the groomer or the vet. 'Be Quiet!' - this may sound at odds with what you're trying to do, but you'll learn how to train a puppy to bark (not all puppies do!) and then you teach him to stop barking. 'Wait! and Stay!' - two very similar commands, one more 'permanent' than the other. Discover the differences and how to teach them to your pet. 'Down!' and 'Stay!' 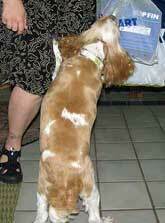 - using these two puppy training commands together can be very effective. I use them to keep my Cocker in one place for a few minutes while I'm busy. He's usually preoccupied with being my shadow, and I've almost fallen over him, so using this command keeps him from under my feet for a while. 'Here Boy!' - the recall command is very important and I recommend you sharpen his response to this training by repeating it whenever you get the chance. Always reward him for coming back to you. Never scold your Cocker for returning to you when called, no matter how long it's taken him and how frustrated you may be. 'Leave It!' - how to train a puppy to leave something alone and not to touch it. This command should be learned well and reinforced as often as possible. Max responds to this immediately, but I do need to keep reinforcing it with a short training session every week or two. I simply make it a fun game and reward him with a few treats. 'Drop It!' - it's important that your Cocker Spaniel learns to 'leave' and 'drop it' as early as possible. Not only will these commands help to make him a well-mannered pup, at some point, they could actually save his life! When you're out walking with your dog, there's nothing worse than being pulled along by an over-enthusiastic Cocker who won't walk on a loose lead! Cockers often pull on the lead and it can spoil your walk. Training your puppy to walk on a loose leash while he's still young will help to stop this habit from forming. If it's left too late, your pup will learn that pulling forward on his lead gets him to where he wants to be and it becomes a habit that's very difficult to break. Follow these simple guidelines on leash training and you'll be enjoying stress-free puppy walks sooner than you think! Like most training, it shouldn't be all work and no play; puppy training should be fun for you both! But can you believe it, some puppies don't know how to play? Sometimes it just doesn't come naturally to them, so you may need to teach your little boy how to play some exciting puppy games, like those below. Fetch! - throwing a ball and having your dog return with it doesn't always come naturally, sometimes you need to give them a clue! Hide and Seek - this is a great game to play with your Cocker Spaniel. I hide and when Max finds me I reward him; usually with a treat, a kiss on the nose, and an enthusiastic, 'Good Boy Max!'. Tug of War - if your dog is showing signs of aggression or dominance, you'd be well-advised to tone this one down a little. You can still play, but there are rules to follow. Otherwise, it's a great game for tiring them out! Find It! - this is very similar to hide and seek but in this case, I hide treats all over the house and let him sniff them out - it's what Cockers do naturally and it's great for stimulating the mind. Chase Me! - this can be a really exciting game for any dog but I don't recommend playing chase with a young puppy - at least, not until he's fully mastered the recall command. I hope you and your puppy have lots of fun with these games and if you've any you'd like to share, why not get in touch and let me know about them? There are some who believe crating a dog, and especially a young puppy, is cruel. Please let me put the record straight - crate training a puppy is not cruel. In fact, it's one of the best things you can do for him as there are many benefits to crating a pup as you will soon discover if you follow the link. Read about the benefits and then decide for yourself. If you do decide that crating is for you and your pup, (and I hope you do, but it's your choice) I suggest you first read the essential rules of crate training before you go on to learn how to crate train your pup. Once you've done that you'll need to crate for your puppy. There are many different types of puppy dog crates available from plastic, to wood, to metal. If your puppy (or adult Cocker) is always seeking your attention it can become quite exhausting, no matter how cute they are! Learn how to handle your puppy's attention seeking behaviour and give yourself a bit of peace and quiet into the bargain! Above all, don't forget, puppy training should be fun, so keep it light!